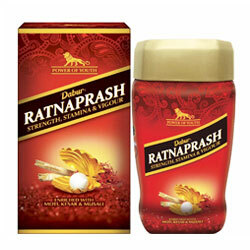 Dabur Ratnaprash for Strength, Stamina, Vigour & Vitality, Reduce Stress, Keeps you Energetic & Active. Dabur - Healthcare - Worldwide Shipping. Increases strength and stamina, provides vigour and vitality, boosts immunity, keeps you active and energetic. Fight fatigue and energy-drained days with the new Dabur Ratnaprash. A power packed formula designed to instill in you the power of youth. A product of extensive research by Dabur Research and Development centre, as well as the backing of the age old wisdom of Ayurveda, Dabur Ratnaprash brings to you strength, stamina, vigour, vitality and energy. Say goodbye to your days of excuses, worries and lethargy, add Dabur Ratnaprash to kick start your life once again. Challenge yourself again. Set new targets. Feel refreshed. Get young with Dabur Ratnprash. Many thousands of years ago, long before written history, human beings probably discovered the first pearl while searching the seashore for food. Throughout history, the pearl, with its warm inner glow and shimmering iridescence, has been one of the most highly prized and sought-after gems. Moti, an age old medicine is good for skin and helps to get youthful appearance. It benefits human system by its health promoting and healing properties. By providing strength it helps in stress reduction, and energizes the body. Saffron has been in use for more than approx. 3,500 years. It spans different cultures, continents, and civilizations. Saffron, a spice derived from the dried stigmas of the saffron (Crocus sativus), has through history remained among the world's one of the most valuable herb. It can take approx 75,000 saffronblossoms to produce a single pound of saffron spice. With its bitter taste, hay-like fragrance, saffron has found many uses over the years from being used as a seasoning, fragrance, dye, and for medicine. Saffron is used as health restorative and helps keep one energetic & active. It is good for the skin and therefore finds its usage in various skin conditions. In the Ayurvedic literature, Safed Musli is known for its health promoting medicinal properties. It is one of the chief ingredient in the preparation of over a hundred Ayurvedic formulations. Safed Musli is a unique gift of nature to mankind since the time immemorial. It acts as vitalizer and strength promoter and helps in improving immunity.